Now I can pry myself away from my engine! Then the black bar that sits above the kickbords, in black hammerite! Brushed off the underside and the engine bay, pulled out the old firewall and the engine bay seal that needed to go! 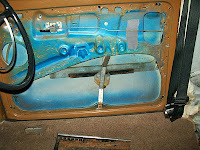 bought new interior light switch seals, door seals. 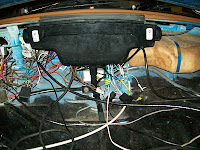 I have also bought new interior light system...more of that when I install it! I am also trying to aquire the de-mister mixers for the hood - Thanks Herell Bug Supplies! Also looking at insulating my panels for heat retention. 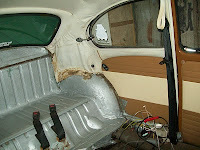 I have bought some sound deadening strip... Thanks Parker Building Supplies!! Need to get some lap straps for my back seats!